Who Is On Your Rope Team? 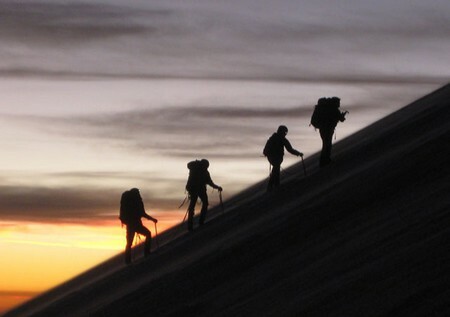 Last evening I watched a riveting, breathtaking and inspiring movie: Touch the Top of the World. It is a true story about the life of Erik Weihenmayer, who overcame insurmountable odds to become the first blind man to reach the summit of Mount Everest on May 25, 2001. The two significant things that spoke loudly to me were the support and camaraderie of his team, and that during the most challenging times they were roped together. It was the vision of a very brave man of what could be, but it was not a 'solo act'. Erik is now a much sought after speaker and the co-founder of 'No Barriers', which encourages people to break through their fears. As I reflect on my life, I too am grateful for the encouragement and support that 'roped' me together with amazing people. Some of my team changed as circumstances changed, while others have remained steadfast since my teenage years. The words of English poet John Donne (1572 - 1631), remind us that none of us is an island entire of itself, but a piece of the continent. As you reflect on your courageous life journey, can you relate? 'Courage' was a thread that was woven into the messages of those of us who spoke at this month's ministry conference in Sedona, Arizona. There were many highlights during the week, not the least being the closing graduation ceremony. Reflecting back, we were 'roped together' with excitement, support and encouragement for each one's journey. The cumulative thousands of hours of study that led to the experience were behind us... and whilst we would shortly return to our respective homes all over the world, and venture into 'new beginnings', the memories would remain! May you be 'roped together' with special ones who believe in, and support your vision. If I can support you, please call. Until next time... Namasté!